HomestayKorea ::: What's on Korea - News - Why are certain brands of Korean cosmetics and makeup so popular? Why are certain brands of Korean cosmetics and makeup so popular? 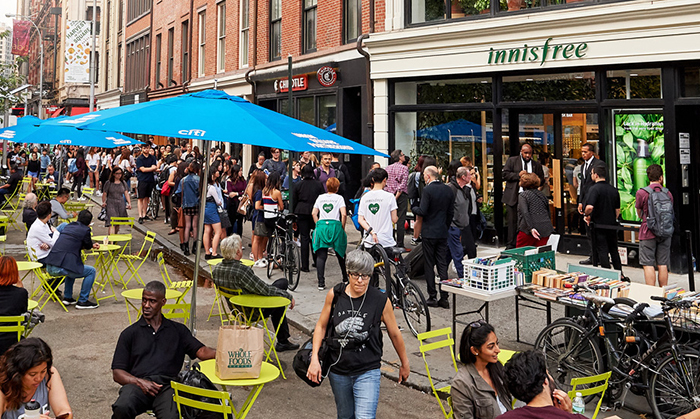 People wait in line to enter the Innisfree flagship store in New York in September, 2017. All throughout 2017, many Korean cosmetic stores in New York or Harajuku were crowded with shoppers. Reviews of Korean cosmetics and makeup are overflowing across social media, especially on the wide range of YouTube beauty channels. According to the Korea Customs Service, the trade surplus in goods for Korea in the cosmetics and makeup industry in 2017 topped KRW 4.2 trillion for the first time in history. That is an 18.5 percent increase on the trade surplus in goods in the makeup industry from the previous year. Exports of Korean cosmetics started to really grow in 2012, and they have continued their positive trade surplus figures for six consecutive years. The mainland China market ranks as the number one destination for Korean cosmetic exports, accounting for 37.4 percent of all Korean makeup exports. Hong Kong, the U.S. and Japan are the next highest destinations. 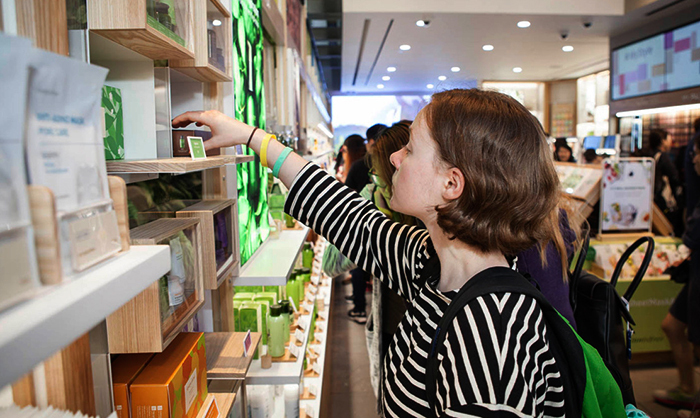 Shoppers try out the cosmetics on offer at the Innisfree flagship store in New York in September 2017. One major Korean cosmetics company cited three major factors for the worldwide popularity of their cosmetics. First of all, the broad theme of many cosmetic brands from Korea is "nature." Many cosmetics from Korea contain natural vegetable-based ingredients, such as ginseng and green tea, and those are growing in popularity. For instance, Amorepacific’s Sulwhasoo Yunjo Essence, which is an "herbal boosting serum" based on a ginseng extract, recorded its highest sales last year, amounting to some KRW 189 billion. Second, product planning in many Korean makeup companies is creative and innovative. Last year, all-in-one products that focused on user’s convenience hit the jackpot. The planning strategy to develop so-called “cushion compacts,” which combine the roles of sunscreen, a makeup base and a foundation, resulted in a 5.5 percent increase in sales and a surplus of KRW 2.3 trillion compared to the year before. Finally, high-quality products can be bought from many Korean cosmetic companies at an affordable price. Most of the cosmetic brands made here, such as Etude House, Missha, The Face Shop and others, are priced under KRW 10,000, and even for the luxurious lines they are mostly less than KRW 60,000. In addition to all this, the Korean government's support for exports contributed to the growth in overseas cosmetic sales. Starting last year, the Ministry of Food and Drug Safety opened an online support center for exports of cosmetic products. It is also promoting any Korea-made cosmetics by opening its own cosmetic stores, and arranging beauty forums and expositions all around the world. This government promotion has proven profitable in Vietnam and Indonesia, for instance. In 2017, exports of Korean makeup to Vietnam saw a 96.9 percent increase over exports there in 2016, topping USD 140 million. As for Indonesia, exports there saw an increase of 60.8 percent and were worth some USD 24 million in 2017. Minister of Food and Drug Safety Ryu Youngjin said, "In the future, we will continue to support exports of Korean cosmetics. This trend for Korean cosmetics and makeup is especially prevalent in mainland China, Vietnam and Indonesia, and its popularity is expected to continue this year."